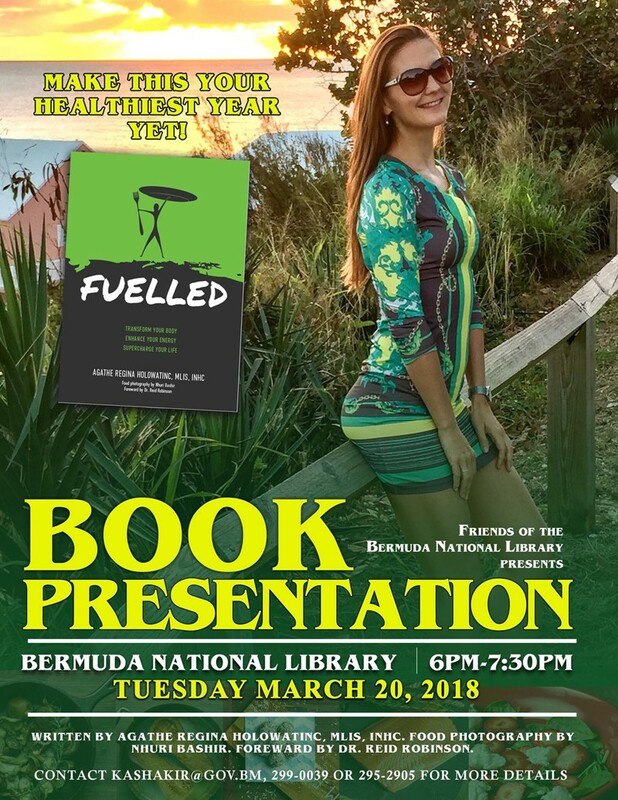 Agathe Regina Holowatinc, author of Fuelled: Transform Your Body | Unleash Your Energy | Supercharge Your Life, will be launching her book today [March 20] at an event to be held at the Bermuda National Library. A spokesperson said, “Fuelled is the ultimate guide to transforming your body, enhancing your energy and supercharging your life. If you’re ready to make this your healthiest year yet, then you will benefit from reading this book. “What makes this book different is that it is divided into these three meaningful sections that represent the steps it takes for you to progress on your journey to getting fueled successfully: Educate > Inspire >Transform. “Part education, part inspiration and part real food recipe guide, Fuelled is a comprehensive, easy-to-read handbook chock-full of simple instructions for achieving peak health and performance through optimal, nutrient-dense eating. Get ready to renew your outlook, revitalize your energy, shed body fat, and create a level of optimal health that you might have previously considered unimaginable for yourself. Because vibrant health is your birthright. “Expect to get education and raise the bar on what food can do for you; learn how supernatural foods fuel your body and help you shed unwanted weight and enhance your energy for the long-term; get inspired to fight your fears, find your fire, and visualize your best self; set yourself up for success in a big way; get started with 100+ delicious and easy super-food recipes designed for optimal health and performance; and fuel your cells and propel your life forward. Author Agathe Holowatinc is a Bermuda resident and a passionate advocate of real food, holistic approaches to health and communicating big ideas in a simple way. She is a graduate of the Institute of Integrative Nutrition in New York City and trained in modern health coaching, eastern and western nutrition philosophies, and relating the impact of dietary and lifestyle changes on optimal health to others. Fuelled is about teaching people, inspiring people, and showing people – even providing a Fuelled Real Food Recipe Guide – how to feed their body with the proper fuel it needs for sustained weight loss and enhanced energy for the long term. “Fuelled is packed with cool, full-colour, full-page photographs that’ll inspire you to get cooking. They were all prepared and taken in the author’s kitchen and not touched up with paint or other fake food photography enhancements,” a spokesperson said. “The foreward to the book is written by Dr. Reid Robinson, DC, Chiropractor, Wellness Practitioner, Owner and Founder of Inside Out Wellness Centre. “A serial health nut, he has been studying human wellness for over 20 years. Reid is a living, breathing billboard for the wellness lifestyle is known for his compassion, easy-going personality and specialty in acute and chronic spinal pain, headaches, TMJ syndrome, disc conditions, sports injuries and wellness lifestyle education. He has treated everyone from professional athletes to weekend warriors, newborns to the elderly, and is humbled by the simple complexity of the body. “His background and experiences have led him to conclude that any person [young or “old”] – with knowledge, inspiration, and action – can achieve extraordinary human health! He is committed to inspiring the health and well-being of his patients through a whole person approach, education and role modeling. “Fuelled is full-colour, nearly 300 pages and filled with vibrant infographics, inspiring quotes, thought-provoking ideas and over 100 easy, healthy recipes with stunning food photography by Bermudian photographer Nhuri Bashir of INTO Bermuda. “It will be available at the Bermuda Bookstore this week in hardcover, with the paperback edition coming shortly. It is available on Amazon.com, Amazon.uk, Amazon.ca, Barnesandnoble.com and other online vendors worldwide. In bookstores worldwide soon. “Agathe also holds a Bachelor of Arts degree with a Major in Communication from Simon Fraser University and an ALA accredited Master of Library and Information Studies degree from the University of British Columbia. Congratulations, Aga! So happy for and proud of you!